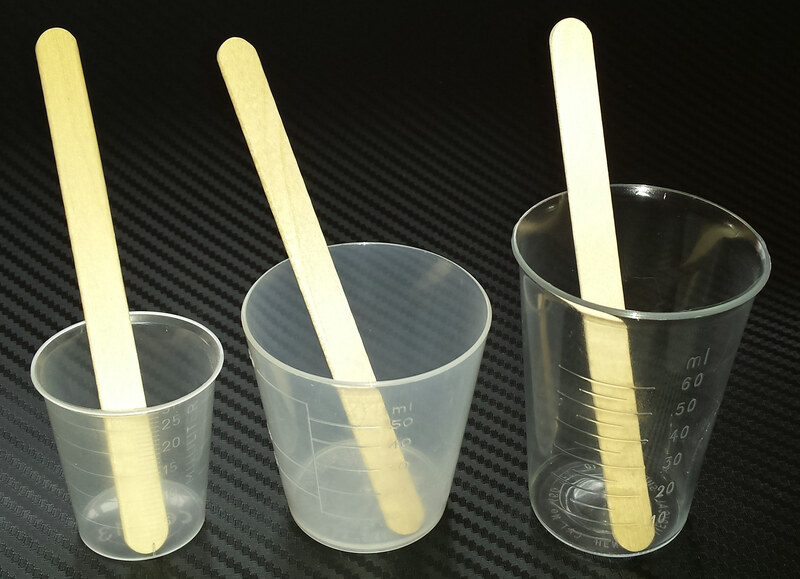 Measuring / Mixing pots with spatulas in three sizes, 30ml, 50ml/60ml and 60ml. 30ml pots in 1ml increments. 50ml/60ml pots in 10ml increments. 60ml pots in 5ml increments. 30ml pots, ideal for measuring small quantity of epoxy resin and hardener. Also good for measuring catalyst for polyester resin or polyester gelcoat. 50ml/60ml pots, ideal for measuring larger quantity of epoxy resin and hardener. 60ml pots, ideal for measuring larger quantity of epoxy resin and hardener. 30ml graduated pots with spatulas qty 10 of each. 50ml/60ml graduated pots with spatulas qty 5 of each. 60ml graduated pots with spatulas qty 5 of each.